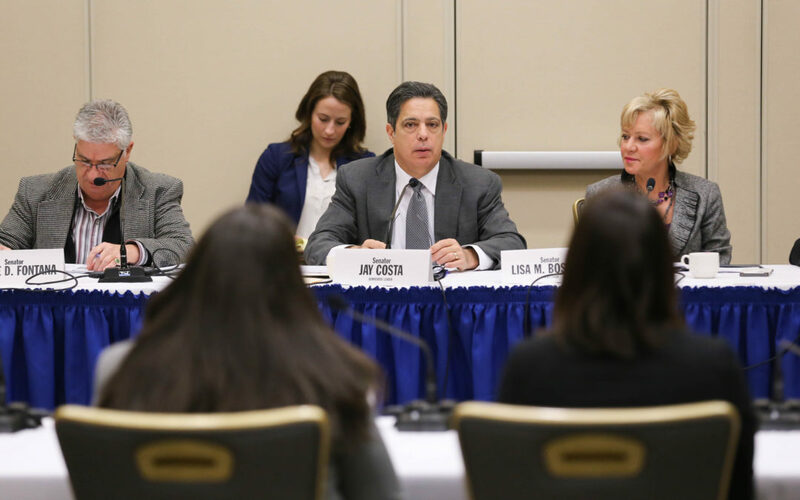 Pittsburgh, December 8, 2017 − At the request of state Senate Democratic Leader Jay Costa, the state Senate Democratic Policy Committee today held a hearing on Costa’s legislation that would enable families to seek court-ordered addiction treatment for their loved ones. The Allegheny County lawmaker has introduced Senate Bill 391, which would enable family members to petition the court to commit for drug addiction treatment someone who is an imminent danger to themselves or others. The proposed court-ordered treatment could only be considered if the addict has overdosed, is a suicide threat, has been unable to adequately care for themselves or is a threat to others. Under the bill, families would petition the county authority for drug and alcohol programs. If the judge agrees to file a warrant, the person would be examined within two hours to determine what type of treatment is recommended. If medical experts believe treatment should be extended, the person being treated would be entitled to a hearing. According to a joint University of Pittsburgh/DEA Philadelphia Division analysis, 4,642 Pennsylvanians died from drug abuse in 2016 – a 37 percent increase over the previous year. There were 648 overdose deaths in Allegheny County, 102 in Beaver County, 74 in Butler County, 106 in Washington County, and 174 in Westmoreland County. Statewide, opioids were identified in 85 percent of drug-related overdose deaths last year. Tina Flowers and Don Holman provided powerful accounts of how their sons became addicts and died. In describing their frustration with the system and how it thwarted their attempts to get their boys the treatment they needed, both endorsed the Costa legislation and requested that such a court-ordered treatment process have no unnecessary delays. Speaking to concerns about infringement on civil liberties, both parents noted that the alternative is too often death. “My son died without his civil liberties being violated,” Holman said. Marc Cherna, who serves as deputy director of the Allegheny County Department of Human Services, called for additional state funding and other resources to help combat the drug epidemic. Boscola said, “In my view, if we can’t make the tough choices to combat drug addiction, then we are simply resigning ourselves to more of the same – more crime, more addiction, and more loss of life.”. Joining Boscola and Costa at the Duquesne University hearing were Senators Jim Brewster (D-McKeesport) and Wayne Fontana (D-Brookline). Mark Sarneso, MS, Director of Central and Western Region, Gaudenzia Inc.
Rosa Davis, executive director, Pennsylvania Organization for Women in Early Recovery.